The minute I saw this cake on Lisa's fabulous blog~Parsley, Sage, Dessert and Line Drives~I knew it would be a part of my baking future~pronto! When Lisa bakes/cooks, she does so at full throttle, and this cake was no exception...I was so enthralled with the ribbons of berry puree running through the batter. So pretty! 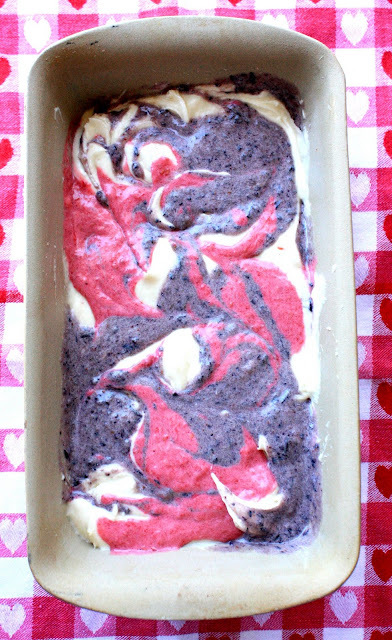 The raspberry and blueberry swirls even look pretty unbaked, don't you think? I used blueberries instead of blackberries(which Lisa used) because that's what was available at Costco the day I shopped:) Lisa also used yogurt in the recipe (which I mistakenly thought I had), but I used sour cream. I need to improve on my swirl technique next time, so that there's more of it. Even so, the puree on top helped this cake turn out "berry" delicious~sorry, but I couldn't resist. 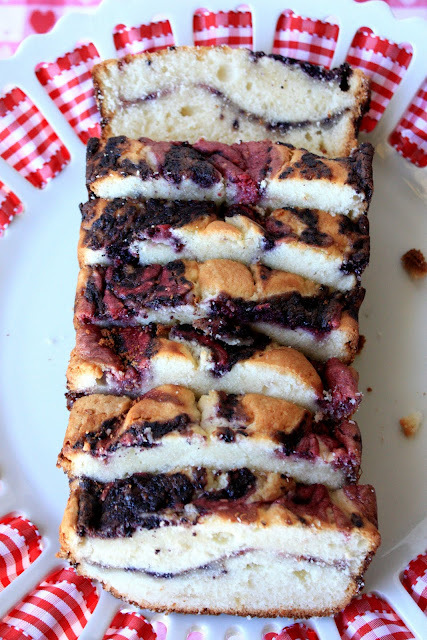 The ribbon in the middle guarantees more berry flavor in every bite! Thanks, Lisa! Bid a fond farewell to summer with this beautiful treat! 1.Preheat oven to 350 degrees. Lightly butter a 9-by-5-inch loaf pan and line with parchment, leaving a 2-inch overhang on all sides; butter parchment. In a food processor, puree blackberries with 1 tablespoon sugar. Wipe out processor and puree raspberries with 1 tablespoon of sugar. Pour/scrape into separate bowls and set aside (you can strain them into the bowls if you don’t like the light bit of seeds that do not break down). In a medium bowl, whisk together flour, salt, and baking powder. 2. In a large bowl, using an electric mixer, beat together butter and 1 1/4 cups sugar until light and fluffy, 5 minutes. Add eggs and vanilla and beat to combine, scraping down bowl as needed. With mixer on low, add flour mixture in 3 additions, alternating with sour cream, beginning and ending with flour mixture. 3. Stir two to three tablespoons of the cake batter into the bowl with the blueberry puree until uniform. Stir two to three tablespoons of the cake batter into the bowl of raspberry puree, until uniform. 4. Pour half the plain batter into the pan and dot with 1/2 of the blueberry puree -batter mix and half the raspberry puree-batter mix - cake batter. Swirl/marble lightly using a skewer or knife. Repeat with remaining batter and remaining puree-batter mixes, then again, swirl batter and puree-batter mixes together, pushing skewer or knife all the way to the bottom for a full marble. 5. Bake until golden brown and a toothpick inserted in center of cake comes out clean, about 1 1/4 hours. Let cool in pan on a wire rack, 30 minutes. Lift cake out of pan and place on a serving plate; let cool completely before slicing. They look perfect to me! What a delightful creation. And I consider it healthy too! Aren't we eating fruit, after all?! :D Thanks for sharing. 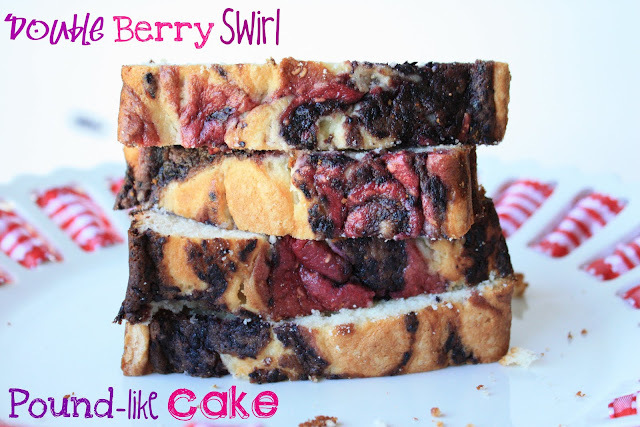 I love how the swirls of fruit look in this cake! What a great way to use summer fruit. YUMM!! It is like edible art! I can just imagine how rich and moist it must have tasted. The colors are so pretty! I am in such a baking mood with cooler temps. This needs to be on the list. I can even see it grilled with a scoop of vanilla and raspberry sauce. Oh no, my imagination is out of control- better go eat breakfast! That looks delicious and I'm going to be making it. Thanks. Ooohhhh. This is beautiful. I love the vibrant color. So pretty and I love coffecake. It's healthy right...because of the fruit. This looks so darn good...can't wait to try it! You have really outdone yourself on this beauty Sue :) so pretty! The cake loooks really good, I love berries in anything and I am sure in this cake they taste amazing. I will book mark this recipe. This looks absolutely awesome. What a yummy recipe. ooh my, this looks so awesome I want 2 pieces to start with. Oh I just want to stare at it too!! It looks gorgeous! I don't know how I missed that recipe, but thanks for bringing my attention to it. Delicious Sue ^_^ bello da vedere e buono da mangiare! I'm making this! It looks delicious! Those swirls are amazing in color. This is great... it looks so pretty with all of those swirls. I'll have to try this. Thanks for sharing! How did I miss this!? It's gorgeous and looks delicious. My daughter would LOVE the colors. I wanted to rush out and make this cake when I saw it on Lisa's too. Now I'm determined to bake it. It looks fabulous! This made me smile...it looks fantastic! Yummo - and great work incorporating what you had handy and I love your berry pun. How gorgeous is that color -- amazing! That looks so incredibly good! So pretty!! a thing of beauty is right! This looks so delicious. I wonder how it would go over with my bag of frozen loganberries.